The main library staff was very nice & allowed me to renew over the usual renew limit. I didn't read front to back as I usually do as this was a difficult read since so much info is outdated but it held my interest in a few key areas & taught me at least 5 new ideas to consider so for that reason I'm giving it 3 stars. Truly, all this info is probably on websites in a more current & up to the minute style but I still prefer books to web reading. If the web is your preference for learning new need to know info then this is at at best a 2 star book.spoiler alert:Best nugget of info: pg 135 (about public speaking) quote:1. Plan your talk using a simple 4 part formula. You may have heard the advice, "Tell ' em what you're going to tell them, tell ' em, then tell 'em what you told 'em," but I think a slightly different schema works better. First hook the audience's interest with a brief story, a set of questions that elicit a show of hands or strartling statistics. Then state the focus of the talk & any background or practical details needed to orient the audience. Next present your content. And finally, pull things together with a closing story, a restatement of your main theme, or an appeal to action.Recently, I've attended a series of lectures & most followed this formula, the ones which didn't weren't as dynamic. An optional-read book on market positioning for the knowledge worker, manager, executive, or entrepreneur. Marcia Yudkin - Marcia Yudkin is a popular marketing mentor and business coach. An introvert who delights in the spoken and written word and in the power of an unusual angle, she guides clients toward creative, practical, short-term and long-term business success. Her 17 books range from Inspired! 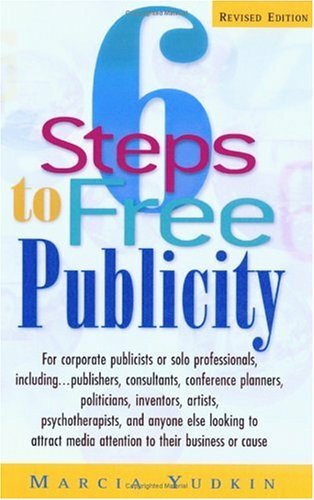 (2013) and Meatier Marketing Copy (2010) to Six Steps to Free Publicity (3rd edition, 2009) and Freelance Writing for Magazines & Newspapers (1988, a Book of the Month Club selection).